Some years ago I got myself a Nokia E90 and it had a build-in GPS receiver, great! I had some ideas about using it for traking when i was out in the countryside on my bike, or sailing my kayak, I even had been playing with the idea of using it for making maps (some years before I had mapped the coastline of an small island where the family has a vacation home, on an old Garmin, but never got any further). So I had this greate phone, but lacked some tools to do the tracking. After some surfing on the net, I found a tool called bbtracker, it was for an BlackBerry, but was programmed in JavaME, and could run on the E90 without too many problems. I also found something called OpenStreetMap, just the project I had been thinking about for many years, so I was hooked! Over the time I became aware of some shortcommings in bbtracker. Fortunatly bbtracker is opensource, so I downloaded the source and made some changes, and have been using this version ever since. 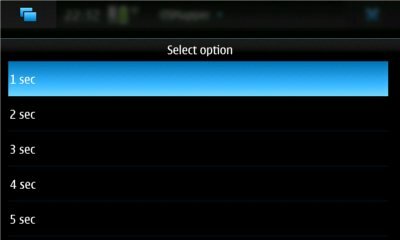 Lately I got a new phone, an Nokia N900, and it does not run JavaME programs, so I decided to make my own tracking program. Well over the time I have found, that while mapping, the track are not everything, you have to take a lot of notes such as street name, surface conditions, pedestrian crossings, post boxes etc. Why not make these notes directly on the phone? A very simple tracking tool for OpenStreetMap surveyors using the Nokia N900, it doesn't show any maps or even your track, it just tracks where you are going, and stores it. 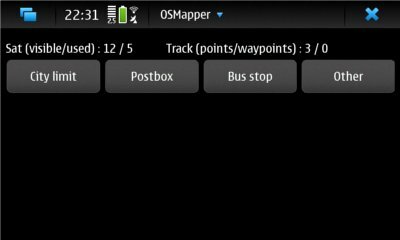 But it also allows you to define some buttons for the most used waypoints, so you just have to press the "Bus stop" button to register the location of a bus stop, and to make ad hoc notations for not-so-often used waypoints, street names or whatever. When you are done mapping, everything is exported to an .GPX file, ready to be imported into OpenStreetMap. Users manual for version 1.3. 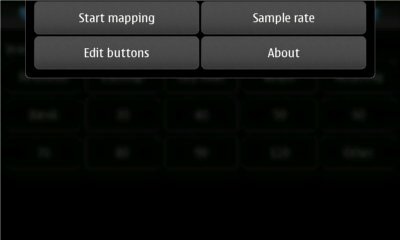 When you start OSMapper you will get a screen somewhat like this. 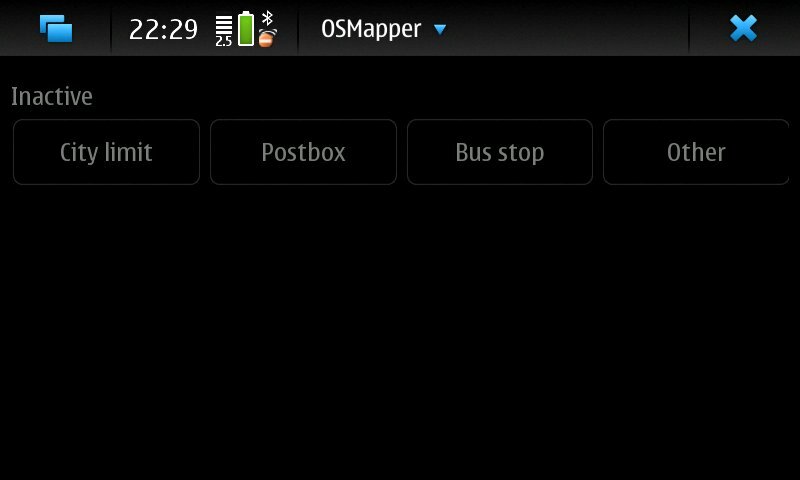 The screen layout are quite simple, below the Maemo status line and menu you'll find the OSMapper status line, at the moment it says Inactive as the mapping hasn't startet yet. 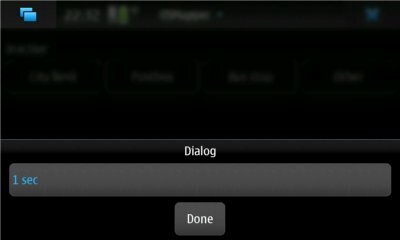 Below the status line are the button area, here you can define the waypoint shortcuts you want, each will be represented as a button. The Other button will always be there and will always be last. Lets take a look on the menu. When you start mapping, the statusline will change to "Wait...." until a GPS lock has been accomplished. Number of track points registered. 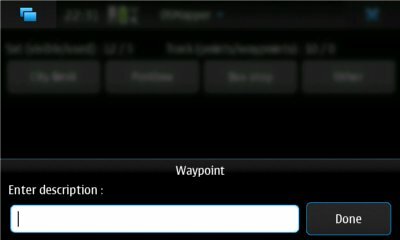 Whenever you press a waypoint button the number of waypoints will change accordingly. 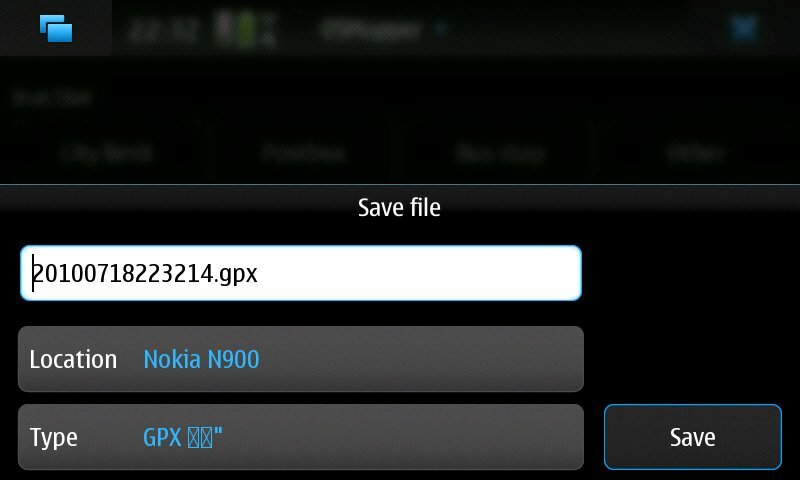 If you press the "Other" button, you will get this dialog, allowing you to enter any text you want to. When you are done mapping, you select Stop mapping, this will stop any recording of your position, and the program will show you the following dialog in preparation of exporting the track and waypoints to a .GPX file. the suggested filename will always be in the format of yyyyMMddhhmmss.gpx. If you cancel this dialog the track will not be saved. This dialog allows the user to control how often the GPS location is sampled. 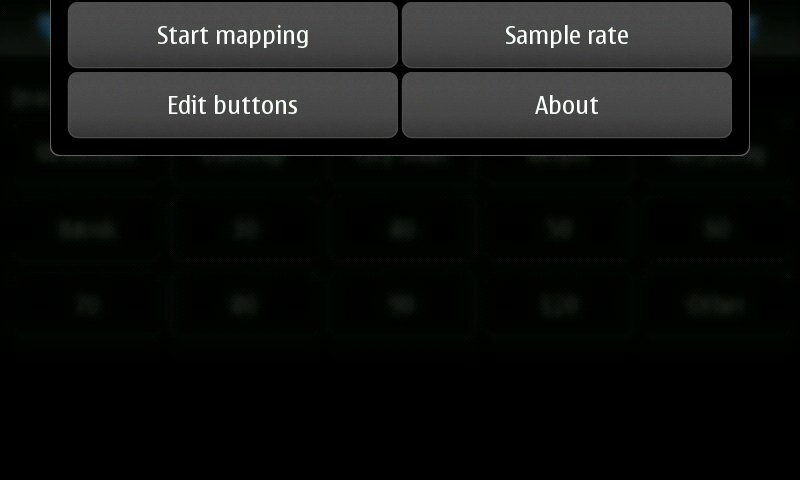 The sample rate can be changed at any time, without loosing any samples. On foot : 10-15 sec. pr. sample. On bicycle : 5-10 sec pr. sample. In car at low speed : 2-5 sec pr. sample. In car at higher speed : 1-2 sec. pr. sample. In this dialog you can edit, delete and insert waypoint buttons, one line equals one waypoint button. 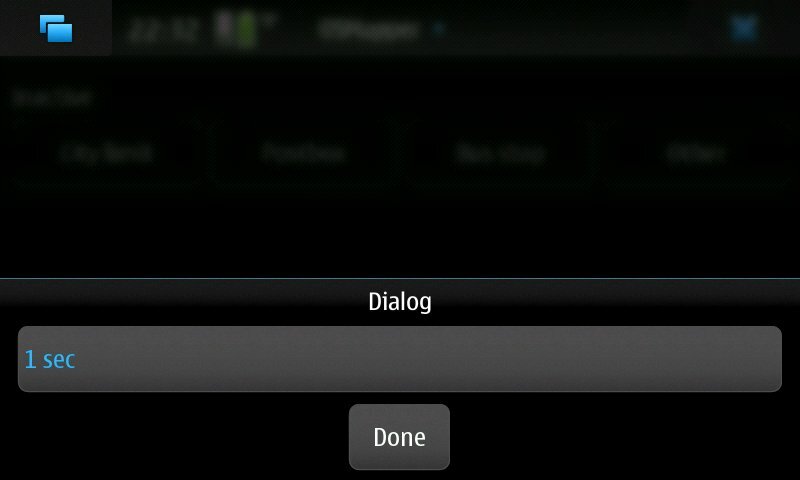 When you are done, tap "Done", to cancle tap somewhere outside the dialog. Any changes to the waypoint buttons is saved on accept and will be restored the next time you start the program. 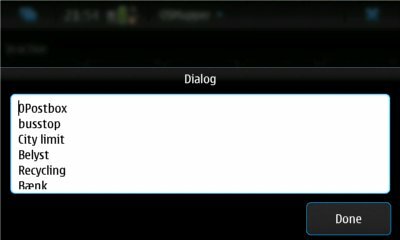 This will show the about dialog containing version information.